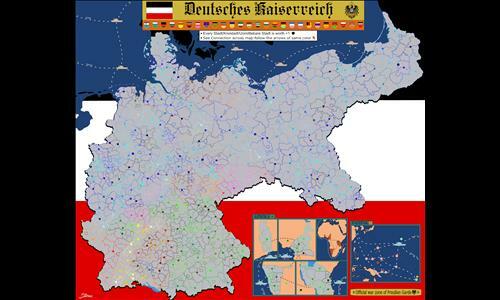 The map depicts the German Empire (Deutsches Kaiserreich) in year 1900. Special thanks to my clan, Preußen Garde, for the testing and advice, in particular: Aurx, Black Sheep [PG], 123Chaos, Lux, Naram-Sin, Olkani [PG], Raschid. Review by Nathan on 1/19/2018. I love well-executed big maps, and this one is no exception. I also love that you've depicted a fixed point in time - very cool to learn about history this way. Review by eliod on 1/24/2018. A new historical Highlight. Very much investigation and time are in this map. Furthermore very well designed. - The Bonuses are a bit confusing. But even that is historical correct. My respect for your map! Review by Olkani [PG] on 1/18/2018. Review by Ramteid on 2/13/2018. Review by olo72 on 1/20/2018. Review by DeBest28pol on 1/23/2018. Review by Thomas2911 on 2/1/2019.